As of tomorrow, we have been in Marathon for seven weeks. Holy Mackerel. We have got to get out of here. So we've started to plan our escape. Yes, it's about making lists and doing a few more boat chores and projects... buying those last couple of crucial items -- the spare propeller for our outboard, the extra can of non-stick baking spray (do they have Pam in foreign lands?)... reading all our new owners' manuals, so we understand (to some small extent) all the new stuff we have on board. But it's also about deciding: Where shall we escape TO?? We're pretty new at this cruising life, so we are still learning about the many phases of "route planning." Here's our thinking so far. 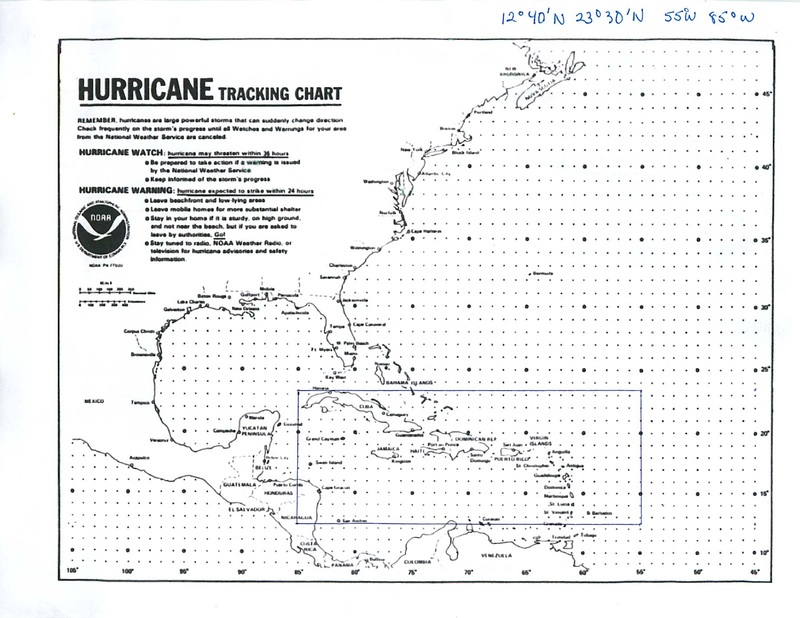 We aim to get south of the 'hurricane box," which is often defined as follows: from 12° 40’ N to 23° 30’ N and from 55° W to 85° W. These are the coordinates used most often by insurance companies, who want to limit their exposure for storm-related damage. (This is not to say that hurricanes don't go other places: New Orleans, the Gulf of Mexico, and Florida are technically out of the box, but all places we want to avoid during hurricane season). Of course, many boats stay in hurricane-prone areas all year round, but full-time cruisers who are insured are bound by the terms of their policies. And, coincidentally, we aren't wild about the idea of riding out a hurricane, whether we're insured or not, either inside or outside of the box. According to NOAA (National Oceanic and Atmospheric Administration), the Atlantic hurricane season is six months long: June 1 to November 30. But most insurance companies use July 1 to November 1 as their "get out of Dodge" span. In fact, August and September are the riskiest months in the Caribbean. We are planning to be out of the box by July 1 (thereabouts). So far, we've considered the hurricane box and hurricane season. Next consideration: trade winds and currents. (A disclaimer here: I am speaking in broad generalities here. Exceptions and nuances abound. We're painting with broad strokes, just now.) Generally, the current in the Caribbean runs in a westerly direction. The winds usually come out of the east (NE or SE, depending on the season and the place.) How this affects our route planning: while we are traveling south to get out of the box, we want to minimize our easting. Going west is almost always easier than going east. Something to do with the direction the earth spins.... : ) In fact, that's why most sailboats travel around the world in a westerly direction - because going east is a slog. The out-of-the-hurricane-box places most often visited by Caribbean cruisers are Trinidad, the ABC islands, Cartegena, Guna Yala (the San Blas islands) in Panama, and the Rio Dulce in Guatamala. Because Trinidad is so far east of Marathon, we have ruled it out. The ABCs are also east and therefore unlikely, although they are not nearly as far east as Trinidad. (ABCs are about 600 miles west of Trinidad.) Our best options, then, are Colombia, Panama, and Guatemala. Only the Rio Dulce is actually west of Marathon, and it is also nearest. Cartagena and Guna Yala are just a bit east of Marathon. But we think we want to visit all three of these places this summer, so where to first? To answer that question, we have to use what we know about the prevailing winds and currents. If the wind comes from the east, and the waves and current come from the east, east is NOT a good direction to sail. The best route to visit Cartagena, San Blas, and Rio Dulce is in that order - Cartagena first, then an easy overnight passage west to Guna Yala, then north and west to Rio Dulce (through the SW corner of the hurricane box - watch out for hurricanes!). I agree that Cuba is TOTALLY in the way! Somebody should DO something about that. Your sense of humor is TOTALLY fun, and I'm hooked on your blog. Thanks Eric! I never realized HOW totally in the way until we started thinking about how we were going to get around it. Dang! They should build a Cuba Canal, maybe.